Lot # 17: 1932 Babe Ruth New York Yankees Game-Used Bat with Outstanding Provenance PSA/DNA GU 8.5 and MEARS A9.5 - Year of the "Called Shot"
Babe Ruth H&B game-used signature-model (pre-dating model numbers) bat dating specifically from the Yankees' 1932 World Championship season. Graded GU 8.5 by PSA/DNA and A9.5 by MEARS. 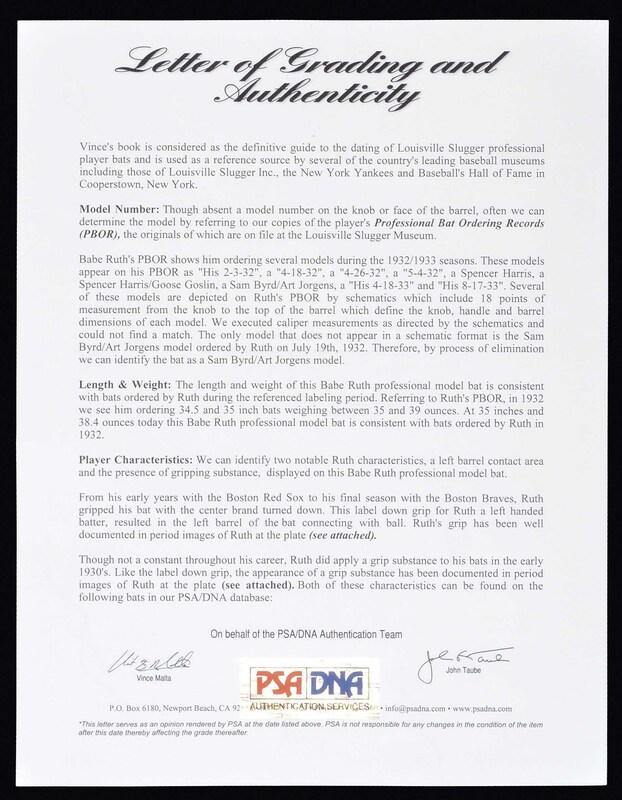 Robert Edward Auctions has sold numerous Babe Ruth game-used bats over the years, but few can equate with this exceptional example with regard to provenance, pinpoint dating, and quality. 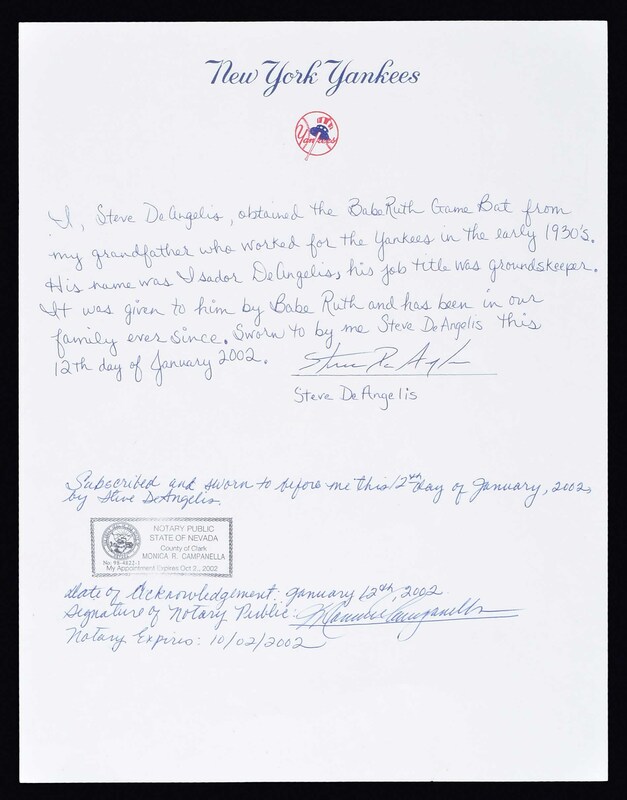 The bat originates from a former New York Yankees groundskeeper, named Isador DeAngelis, and is accompanied by one-page notarized handwritten letter from his grandson, Steve DeAngelis. In full: "I, Steve DeAngelis, obtained the Babe Ruth Game Bat from my grandfather who worked for the Yankees in the early 1930s. His name was Isador DeAngelis, his job title was groundskeeper. It was given to him by Babe Ruth and has been in our family ever since." While DeAngelis' letter mentions only that his grandfather worked as a groundskeeper for the Yankees in the early 1930s, physical examination of the bat confirms the time period. According to both PSA/DNA and MEARS, this bat dates specifically to the year 1932. 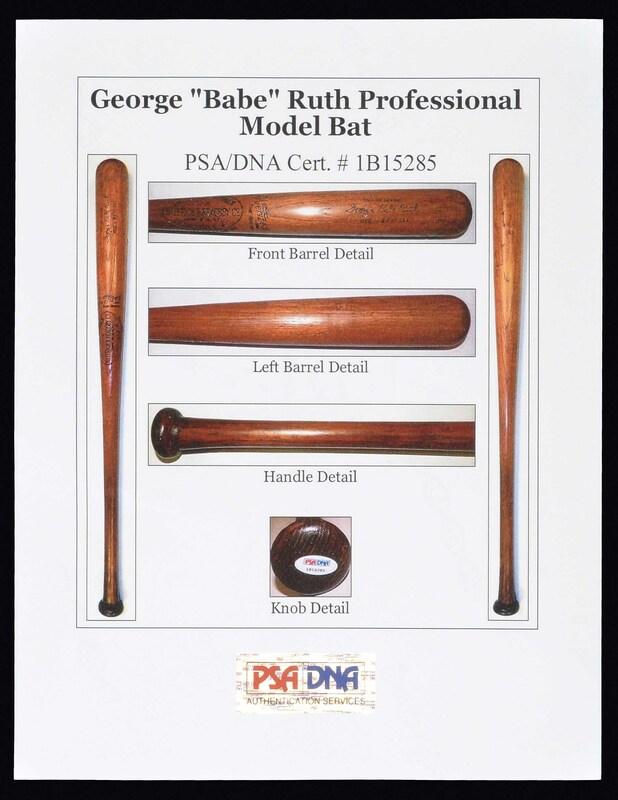 The dating was determined by the style of center brand and "Powerized" stampings (the combination of which only only appeared on H&B bats in 1931 and 1932), together with an analysis of Ruth's H&B shipping records. 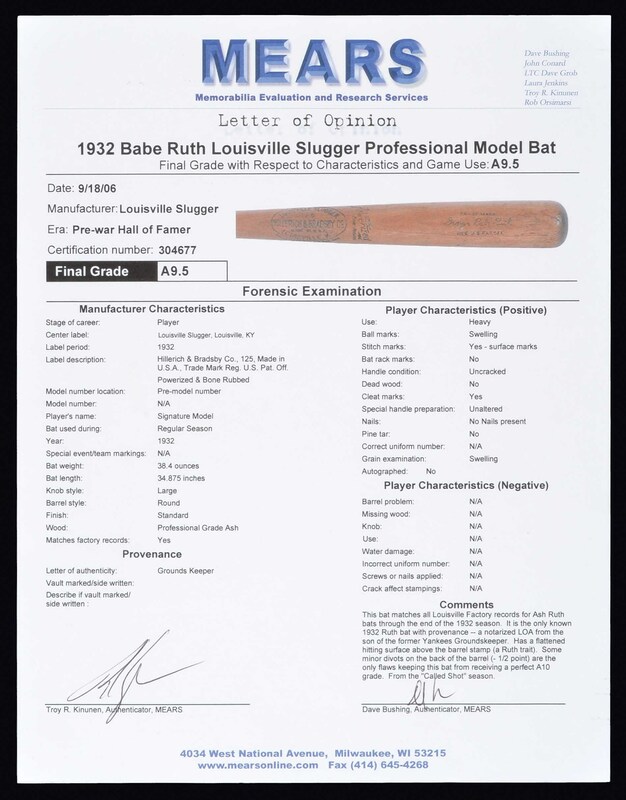 According to PSA/DNA, given the bat's specifications of 35 inches and 38.4 ounces, it was determined to be the "Sam Byrd/Art Jorgens" model listed in Ruth's factory records, an order of which was shipped to him on July 19, 1932 (for a complete analysis please see the PSA/DNA and MEARS LOAs, both of which are pictured in their entirety on our website). With regard to use and player characteristics the bat could not be any finer. 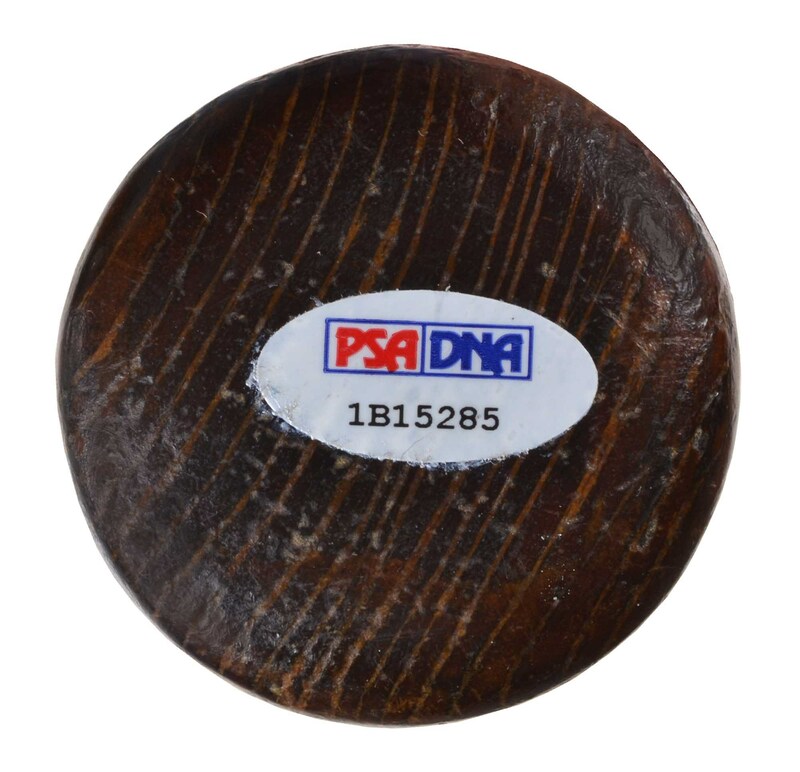 According to PSA/DNA the bat "is un-cracked and displays evidence of excellent use. Several ball marks and grain swelling from contact can be seen on the left barrel above Ruth's branded name. Several abrasions are on the right and back barrel and there are a number of small impressions on the front and left barrel that appear to be cleat marks. The patina on the lower handle is darker than the upper handle and barrel, possibly darkened by gripping substance, the remnants of which can still be seen. . . . We can identify two notable Ruth characteristics, a left barrel contact are and the presence of gripping substance, displayed on the Babe Ruth professional model bat. " MEARS also describes the use as "Heavy," and identifies ball and stitch marks, cleat marks, grain swelling, and a "flattened hitting surface above the barrel stamp (a Ruth trait)." The evidence of heavy use is not surprising given the numbers Ruth tallied in 1932. The "Sultan of Swat" once again lived up to his nickname that year, hitting 41 home runs (second in the league behind Jimmie Foxx) and driving in 137 runs. Ruth also batted .341 and led the league in both bases on balls (130) and on-base percentage (.489). Despite those numbers, Ruth's 1932 season will forever be remembered by his legendary feat in the 1932 World Series. It was in Game 3 at Wrigley Field that Ruth famously "called his shot" by pointing to the center field bleachers right before hitting a home run to the spot indicated. While historians have often suggested that Ruth was pointing at Cubs pitcher Charlie Root and not the center field bleachers, a number of eye witnesses, including many players, have always supported the legitimacy of Ruth's amazing feat. Ruth himself never confirmed that he called the home run, but he never denied it either. Regardless of the true sequence of events, the "Called Shot" remains one of the most famous moments in baseball history and always will. 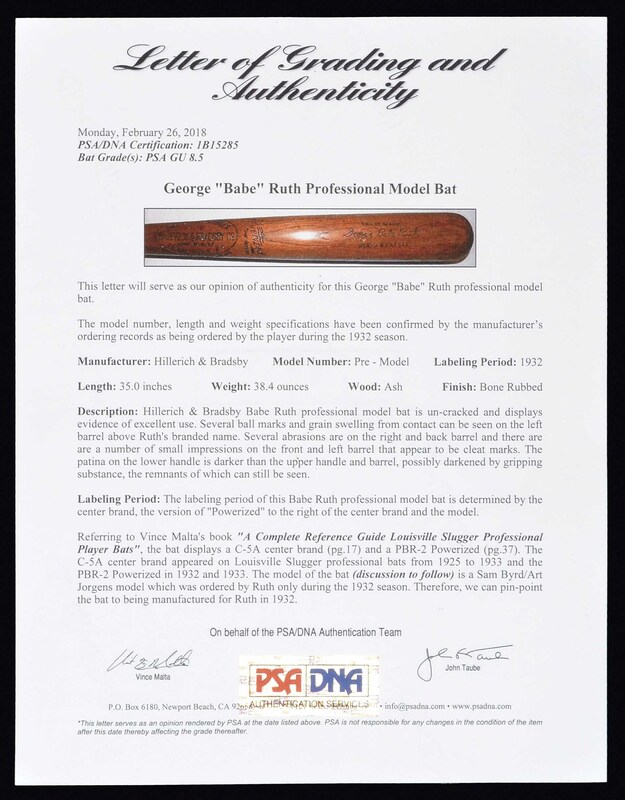 It should be noted that is is one of only three Babe Ruth pro-model bats we have seen dating specifically from the 1932 season, and the only one accompanied by direct provenance. While there is no way to say for certain whether or not this bat was used by Ruth in the World Series, or was used to hit his "Called Shot," the fact that the order it originates from was shipped to him during the second half of the season at least makes it possible. (H&B did not begin the practice of producing specially stamped World Series bats for the players until 1950.) At the very least, it is one of only three Ruth bats for which such a claim can even be made. The fact that the bat is not cracked is also important. Normally, players gave away only cracked bats, which were no longer usable. Instead, Ruth deliberately chose to give DeAngelis a perfectly good gamer that had seen plenty of action, which indicates that Ruth held him high regard. From a provenance and dating standpoint, this is without a doubt one of the finest game-used Ruth bats in existence. It is rare to find such a precisely dated bat, dating to the latter part of such an iconic year in Ruth's career, with such ironclad provenance and in such outstanding condition! The only qualities that differentiate this bat from one that would sell for several hundreds of thousands of dollars are a few minor divots on the back barrel of the bat, which do not detract at all from the overall incredible eye appeal and presentation value of this gem. 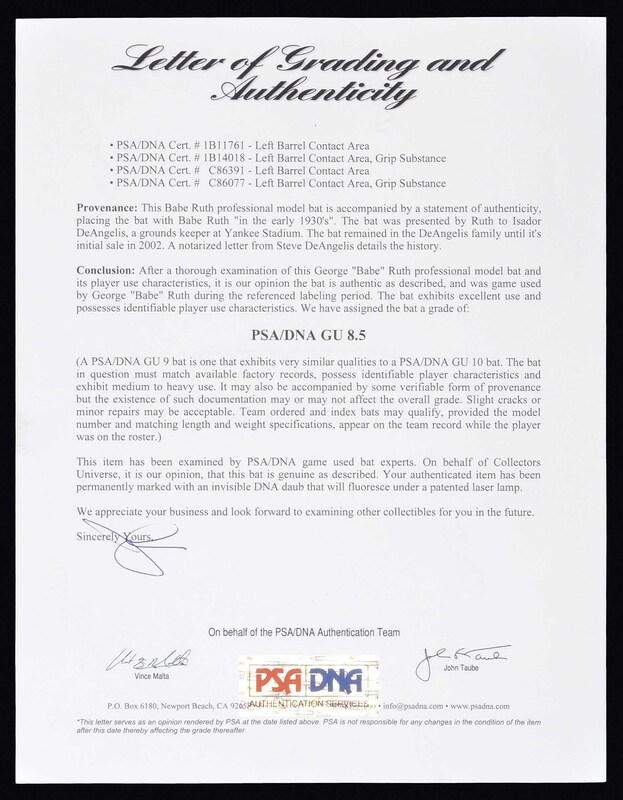 Graded GU 8.5 by PSA/DNA and A9.5 by MEARS. Length: 35 inches. Weight: 38.4 ounces. LOAs from John Taube of PSA/DNA and Troy Kinunen and Dave Bushing/MEARS. Opening Bid $25,000. Estimate $75,000+.